Iners sempiternus was designed for the Royal Society of Edinburgh/Scottish Executive design competition for a trophy design for the 2020 Science: Education Conference.The design behind iners sempiternus (sempiternal inertia, or perpetual inertia) is to create a trophy that is not the usual dust-collecting memento that sits on a shelf, but an intriguing object that represents modern science and technology. In investigating this goal I wanted to produce an object that was only made possible by means of scientific development. 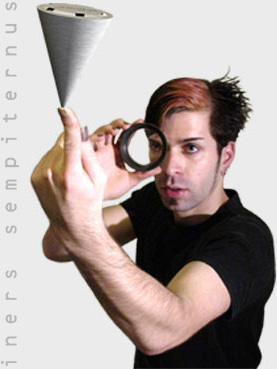 Iners sempiternus is a conical object that defies canonic logic by standing on its pointed end. This is obtained by means of an internal gyroscope. The self contained and sealed unit will have an independent autonomy of about an hour in which it will keep a constant longitudinal axis, after which it will need to be placed back on its power supply plate. Its battery will receive its charge without the need for electrical contact through induction charging, in the same manner that a waterproof electric toothbrush receives its charge. Induction charging is a method used to transfer current from one circuit to another without physical contact. The way this is obtained is by splitting the transformer, that would otherwise be necessary to reduce mains voltage to that necessary to charge the battery, between the charging and charged circuits. The high frequency radiation produced by the mains powered coil is inductively coupled by a receiving coil over a given distance that is smaller than wavelength of the high frequency signal, without the necessity of electrical wires. Hence, the portable part of iners sempiternus contains a receiving coil, connected to a circuit which charges the battery and drives the gyroscope. I believe that iners sempiternus is an object that would capture people’s fascination both during the presentation of an award, and later in life. It is presented here as a non functional concept prototype. Initial images of the iners sempiternus portrayed it as a highly mecchanical yet static device. A machined alluminium cone with a lid that resembles the back of a screw down watch. The base/psu is a simple shape that would be connected to the mains. An exploded view shows how I had invivisoned it working, though after some experimentation I can state that a simple gyroscope run by a motor is not sufficient to obtain the desired effect. My prototype, made out of machined plastics with a lead gyro, went through a lot of changes, and served to prove that there were many phisical aspects of the design that I was not able to deal with alone. Gyroscopic precession is the biggest problem with the design.